How often do I need to empty my hot tub? Hot tubs are ready to use 24/7. The water is always hot. So, it’s ready to jump in whenever you fancy it. Does this mean it’s always the same water? Is that not like sharing a bath with the entire family? Hot tubs are a haven for bad bacteria. The high temperatures (37-40 degrees C), plus the fact that there are usually multiple people in and out, create the perfect environment for bacteria to multiply. 1. Chemicals to kill the bacteria (Chorine or Bromine). 2. Filtration. To trap contaminants in the water. How easy is it to keep my hot tub clean? How to test pH? Hot tub buyer’s guide. How clean is your hot tub? 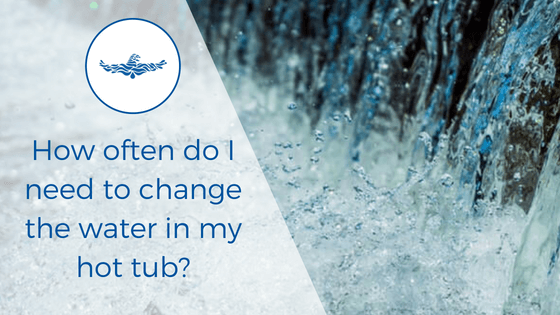 So, how often do you need to change your hot tub water? Generally, most hot tubs will need drained every 3 months. It should work our approx. 3 months, if you take into account that you probably won’t use the hot tub every day. Why do I need to empty my hot tub water down? You might secretly be thinking that emptying your hot tub every three months seems like too much work. Will the chemicals and the filter not do the job of keeping clean forever? Maybe you’ll just do it every four months, or five, or maybe six. Whenever you remember will be fine right? That’s probably not the best idea you’ve ever had. Hot tubs are relatively small spaces of water. Unlike pools, that are constantly being back washed and topped up with fresh water. Hot tub water remains relatively static. It’s usually pretty much the same water until you drain it and refill it. There are ways to keep your water clean. But eventually, you need to empty drain the hot tub and start again. Total dissolved solids (TDS) is the measure of everything that is dissolved in your water. All that is added to your hot tub water, either deliberately or passively. And they are the reason that we can’t rely on chemicals and filtration to keep the water clean forever. In fact, chemicals, are one of the things that add to the TDS. We add chemicals deliberately to keep the hot tub clean. But the chemical residue adds to the total dissolved solids. Chlorine, Bromine, pH plus, pH minus. Plus additional components in the sanitisers such as Cyanauric acid, which is used to stop the Chlorine breaking down in the sunlight. They all add to the total dissolved solid level. And when water evaporates, the minerals and particles left behind increase the TDS concentration further. There are also things that dissolve in the water that we don’t deliberately add. Anything that you have on you body will dissolve in teh water and make it’s home there. Shampoo, dry shampoo, body lotion, perfume, fake tan or skin. If it’s harmful the sanitiser should deal with it. If it’s large enough the filter will capture it. But lots of what we purposefully or accidentally put into our hot tub will join the ranks of Total Dissolve solids. Maximum TDS levels of 1500 parts per million are recommended. But, the limit will depend on what the levels are composed of. Bather load ie. how many people use the hot tub, and their overall cleanliness will be one of the main factors that determines how quickly you have to drain the hot tub. For example if you have a big party with lots of people in and out, you might find that you need to drain it down sooner than 3 months as the TDS will be higher. What is the effect of Total dissolved solids on hot tub cleanliness? As well as making the water look cloudy and smell. It can also put pressure on the filtration system. And if this is not cleaned out, it can damage hot tub components by reducing the flow rate. Why is my hot tub not heating. And how to fix it. Aswell as that it can also make it harder for the sanitiser to do its job. When we first add water to a hot tub, there isn’t a lot floating around. So when we add the sanitiser, it can easily navigate through the water to kill any bacteria lurking. But, when there are lots of TDS in the water, the water is a lot more compacted with organic matter. This makes it a lot harder for the sanitiser to find the germs and kill them. In new hot tub water, finding bacteria is like finding one person in an otherwise empty room. With high TDS it’s like finding that same one person in a room of thousands. A lot harder. So, that’s why we need to empty our hot tubs down when the TDS gets too high. Not only because it doesn’t look nice and can damage our hot tub components. But, because it reduced the effectiveness of sanitisers and can make the water dirty and unsafe to sit in. Not relaxing at all is it? Oh hey, wait a minute. I’ve got one of those fancy self-cleaning hot tubs. So I don’t need to empty it down every three months do I? Uh-oh. Sorry to be the bearer of bad news but you do. Just like every other hot tub, self-cleaning hot tubs and swim spas need to be emptied down every three months. You might remember that one of the features of self-cleaning hot tubs is that it has an in-line dosing system, which continually feeds Chlorine into the hot tub. And now that we know that our chemicals are one of the things that add to the TDS, what do you think that means? That’s right. Got it in one. The constant stream of Chlorine will add to the level of total dissolved solids, potentially giving you a higher level than if you manually dosed Chlorine. While I doubt you will have to empty your hot tub down any more often if you have a self-cleaning hot tub. You certainly won’t have to empty it down any less. So what’s the gist of it all? If you empty your hot tub religiously every three months then you can forget about all the sciency stuff I spouted. If you have heavy hot tub use, such as a big party with loads of people in and out. And your hot tub water is looking worse than you felt the morning after, then it might be due to high TDS and you will want to empty and refill it sooner than the three months. But, regardless of the hot tub that you have. 3 months is likely going to be the maximum amount of time you can go before draining your hot tub down. If draining a hot tub every three months seems like too much to think about. Because you bought your hot tub to relax not to add more work to your plate. Don’t worry. We can do it for you. You might even be eligible to join our new hot tub MOT plan. Sign up and be the first to know.